There are few things more American than semi trucks. There are millions of truck drivers in the United States alone. Not all kids want a fast RC car, some want big and bad tractor trailers. 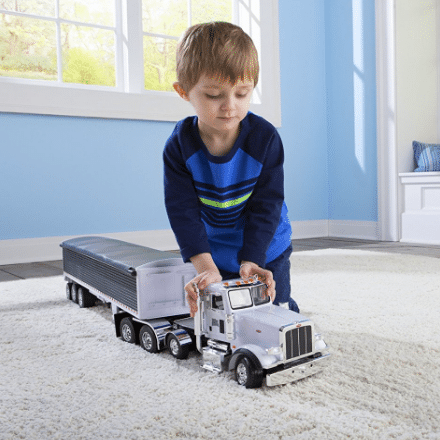 Tractor Trailer RCs make great gifts for kids. What kid doesn’t enjoy driving around an 18-wheeled beast? There are many different sizes, models, and specifications when it comes to all RCs, semi trucks included. one thing to take into consideration is the size and scale of the truck. Scale refers to how big it is in reference to an actual tractor trailer. One that is a one to ten scale will be ten times smaller than the actual thing. There are many other things to look out for when purchasing a remote controlled tractor trailer, so be sure to look below the list for more information. We took a look at almost every single remote control semi truck on the market and came up with this list of ones that we think are the best. These trucks are the best in regard to quality, but also, price. Our top choice for the best RC semi truck is the Tamiya King Hauler Semi Truck. This is a truly high quality, hobby grade RC semi truck. Tamiya is known for making top quality hobby vehicles. The King Hauler Semi Truck is no exception. This quality piece is engineered to be a long lasting, functional hobby vehicle. The King Hauler simply blows all other competition away, as is has features that you won’t find on most remote control semi trucks. For example, this truck comes with a three speed transmission. The transmission really makes this truck more functional as you are able to control it better at low speeds, but can easily move to different gears if you want to go faster. 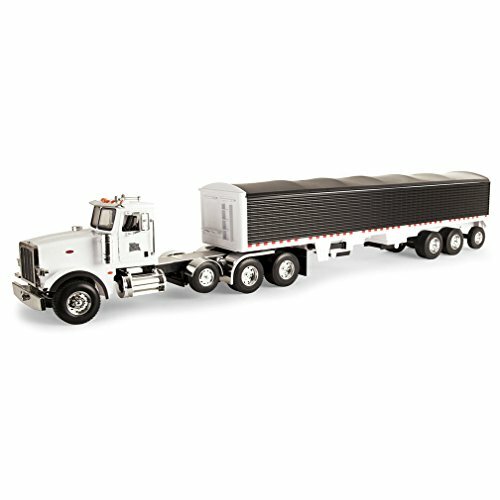 This truck is a 1 to 14 scale model of an 18 wheeler, which means it is about 630mm long, and 186mm wide. This is a great size for a hobby vehicle. It uses only the most quality construction materials for each part, being made up of aluminum, rubber, and ABS plastic. These strong materials make this RC truck durable and long lasting. Another nice thing about Tamiya trucks is they are highly customizable. They have a catalog of upgrades for not only the drivetrain, but also aesthetic pieces. For example, there are many different types of trailers you can haul with this truck. The King Hauler Semi Truck by Tamiya is the best RC Semi truck on the market. There are others that have good features, but none come close to this. It is available on Amazon with free shipping, and it can be had at a stellar price. The second best option in our list of the best remote control semi trucks is the Ertl Big Farm Peterbilt Model 367. This is an eye-opening model that is super realistic. Get your kid one of these as a present and just watch them light up! The big draw of the Ertl Big Farm truck is its realistic features. Not only is it modeled after a real Peterbilt truck, it has features that compliment the look. For example, it has realistic lights and sounds. Watch your kid play with this truck for hours. 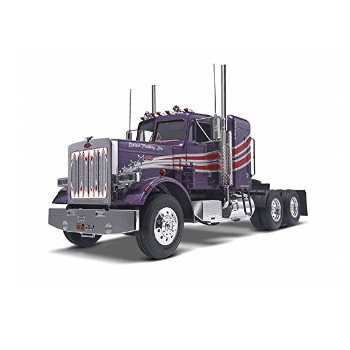 The Peterbilt Model 367 is a 1 to 16 scale model of the original, which makes it a great size for a child to play with. Beyond the lights and sounds, there are a few other features to keep your kids entertained. The wheels open, the mirrors move, and there is even an extra set of wheels included so you can haul extra weight around in this model. This truck is a “grain hauler” so it has all of the same characteristics of a real one. It has an opening tarp, as well as a functional set of hoppers. Once fully assembled, this truck is a little over 4 feet long, which is a very large size for this price range. 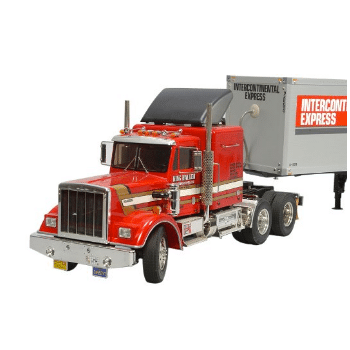 With nothing but excellent reviews, this Peterbilt model 367 is an excellent RC semi truck. If you are looking for a christmas present for your child, but don’t want to spend a fortune, this truck is for you. There are way more features than the average semi toy, and the amazing price makes it even more appealing. 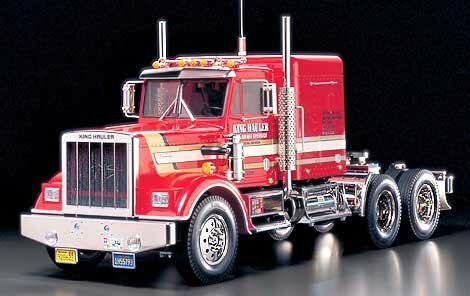 The last RC semi truck on our list is the Revell Peterbilt 359. Like the RC truck by Big Farm, this is a model Peterbilt. But instead, this is a model of a 359. 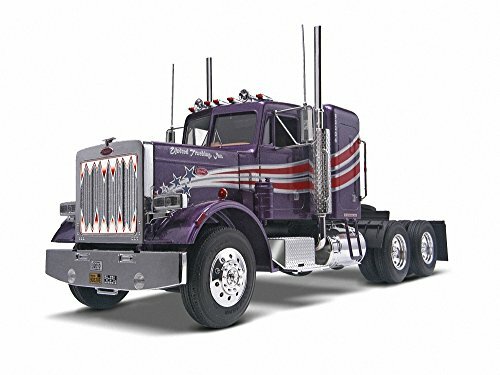 This truck is built as a 1 to 25 scale model of the original Peterbilt 359. The accuracy of the RC is remarkable, which is almost scary. The mechanical pieces also resemble the real thing, as under the hood there is a 6 cylinder Turbo CAT diesel engine. The chrome is shiny, and even the tires resemble the original semi truck. One of the downsides of this truck is that it does not come painted. It comes in a standard white mold, that you can paint yourself. Really, this could be a positive if your are interested in putting your own design on the vehicle. All in all, the Revell Peterbilt 359 is great remote control Semi truck. It has less features and not as great specs as the other trucks in this review, but the ridiculously low price makes up for the weaker specs. How are RC Semis powered? There are many different ways that semi trucks can be powered. They can be powered by electric, gasoline, or nitro motors. In general, electric powered trucks are going to be slower and easier to use, while nitro will be faster and require more expertise. Gasoline is somewhere in the middle of the two, but probably would not be best for beginners. What is the top speed of an RC Semi Truck? The top speed of the RC semi truck is highly dependent on what type of fuel/power source it is using. The electric models will go slower, while nitro will go faster. As well, the weight, design, and price-point all factor into how fast the truck can go. That being said, some semi trucks have been modded to go 60+ MPH! Can I swap out trailers on the back of the Semi? Absolutely! Almost every RC semi is designed to be able to haul different types of loads. Some carry cargo trailers, some open-top trailers, and others oil tankers. Be sure to check with your specific model to see what trailers can be hauled with it. What is the best engine type for first time drivers? In general, we would recommend going with an electric powered motor. This engine type provides the most control, and ease of use. As well, they tend to cost less than their gas-powered counter parts, especially when you factor in maintenance costs. If you have experience with driving RC cars, you may want to go for a higher powered engine. Are Semi Trucks better than Monster trucks? Honestly, it depends. They are different vehicles designed for different things. 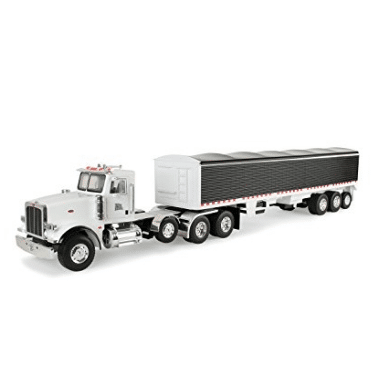 RC semi trucks are designed to replicate real tractor trailers, and haul loads. On the other hand, RC monster trucks are designed to drive in rough terrain. Ultimately the decision is up to you. Think about what you want to do with your RC, and choose a vehicle accordingly. If you want something that can pull heavy loads, go with a semi. If you want to do some rock crawling, choose a monster truck.